I finally managed to steal a few days from my hectic summer market schedule to devote solely to painting & it has been heavenly! 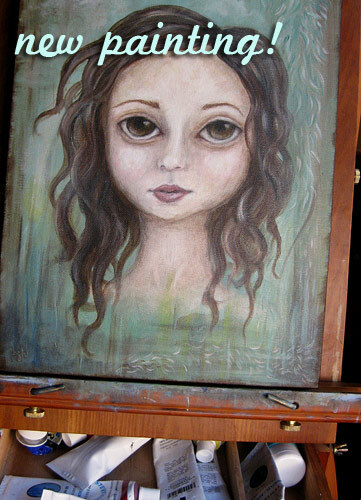 Here’s a sneak peek at the end result, a new painting that has me quite smitten. This new piece is a bit different than my usual style; I took a life drawing class this summer & I think that had an effect on the way this mysterious brunette’s features took shape. I really enjoyed pushing the paint around, playing with lots of layers & glaze & little abstract details in the background. There are small feathery strokes that look like tiny leaves along the right side & the bottom – the kind of brush strokes that make you want to run your fingers along each painted mark. The picture really doesn’t do her justice! Alas, it is back to the markets this weekend for me, so I’m methodically assembling postcard packs & making lockets in preparation. I certainly don’t *dislike* doing that sort of work & I truly love all of the fun trinkets that I make featuring my artwork. But lately there has been a lack of balance in my studio where the making & selling of products has been 95% of my time. The act of creating new characters & of painting pictures has been sorely missed! It will be interesting to see who else springs to life over the rest of the summer. Since the sun has (finally) come out to play on the west coast, I’m looking forward to some hot summer weekends ahead where being outside at the markets will be a joy. A thermos of iced tea, some fresh blueberries…perfect! Love this Kris! Have you named her yet? Love the background-can’t wait to see her in “real time”!